In our prayerful journey through the season of Lent, we have been exploring this preparatory time through the lens of the Andrew Lloyd Webber rock opera, Jesus Christ Superstar. Back in the public eye after its live broadcast on Easter Sunday in 2018, we are exploring a different song from the musical each week alongside its scriptural reference and how we can understand its context and its meaning for us today. The sermon series can be found here. On Sunday, March 24, we will celebrate Palm Sunday, beginning our worship gathering in our courtyard and processing (walking together) into the Sanctuary together as we sing and wave palm branches. This is a few weeks earlier than the traditional Palm Sunday celebration, but we do so to maintain the story arc of our Lenten theme. As always, our worship services will begin at 9:00 am and at 10:30 am. Good Friday falls on April 19, where the church will be open from 5:00 pm to 7:30 pm for an exploration of the meaning of Good Friday for each of us as unique persons of faith. Suitable for persons of all ages and abilities, stations of interactive prayer and learning will be available for participants at an individual pace. 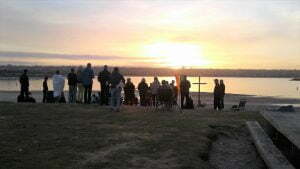 On Easter Sunday, April 21, we will gather together with the Water’s Edge Faith Community at Crown Point Park on Mission Bay for a sunrise service beginning at 6:00 am. This casual service includes coffee, donuts, and Holy Communion. For more information and directions, click here. Back at 1561 Thomas Ave, our Easter celebration services will take place as usual in the sanctuary at 9:00 am and 10:30 am including traditional hymns and a brass ensemble. 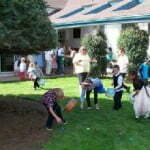 The annual Easter Egg Hunt for children will begin in the courtyard at 10:00 am. Dee and friends will prepare a Pancake Breakfast Fundraiser on Easter Sunday morning from 7:30am to 9:00am. There will be a variety of options including pancakes, turkey sausage, fruit, and more. We will gratefully receive a donation to support our Youth activities. The breakfast will end promptly at 9:00am in order to prepare for the Easter Egg Hunt.